Discussion in 'Console & PC Gaming' started by GTPNewsWire, Mar 15, 2018. This article was published by Brendan Rorrison (@Brend) on March 15th, 2018 in the Gaming category. girabyt3 and Furinkazen like this. Already ordered. I was never not going to get this game. Unfortunately, what a cash grab. There's a PC version which can probably run 4K 60 and it'll look the same for 1/6th of the price. But it seems you don't get the DLC. Still, considering the "remaster" add virtually nothing to the game I just can't fathom why it would be worth buying it. Especially if you've had it before. Nexus, JakeMR2, ThePotatoKing and 2 others like this. It's pretty much just a solid port and not a remaster at all. I rather play it on PC with a ReShade plug-in to get rid of the piss filter. It looks like there is going to be little to no difference playing this on an Xbox One using a 360 disk, especially if your just playing in 1080p. It's ridiculous that they didn't add a single thing, not even a few new cars. crooky369 and VXR like this. Funny thing is, is that it was 'free' under games with gold last year. Seems like a waste on xbox with games getting opimized for xbox x.
Robin and VXR like this. Honestly, I wasn't pretending when I said I got confused when playing it for review. Played the 360 version in tandem and it's totally identical. Digital Foundry did a video pointing out the Xbox One X experience is at least noticeably different - regular consoles far from that experience. sirjim73, SZRT Ice and Robin like this. Makes you wonder why paradise when its easily available for xbox, doesnt look much different to 360(maybe useful for ps owners). Maybe remaster one of the other games such as any of the nfs games (preferrably hot pursuit 2010, except undercover). I would love to see ProStreet remastered. It strikes the optimal balance between having a game that would look noticeably better from having reworked lighting and textures, while not looking too dated to the point that it would require remodelled assets. As with most racing games using real cars and brands, the main issue would be licensing. Plus, it has such a lively atmosphere that could be expanded on using current-gen tech. Yeah Digital Foundry was still saying "ye great remaster" just like they go on about the One X. Not really trustworthy. Paradise was also free with Games with Gold like a year ago and gaming media was all "look at that woah". My kids and I played this one to death when it first came out. My best friend and his kids played it even more than we did - in the end, I'm on the fence (probably won't buy since I still have both the 360 and PS3 versions), while my friend will hit his local videogame store to pick up the PS4 version as soon as the shop opens tomorrow. I see this as a game that many can probably pass on if in my situation, but if you've sold off your 360 (or PS3) software and hardware when upgrading to the current gen systems, then it might be worth it to spend $40 for another pleasant drive down memory lane with an edition of the game that comes with all of the DLC included. I look at it like this: it's the exact same game for those who either sold off their PS3 or Xbox 360, never picked up the game for free on Xbox Gold, or for the PC crowd who aren't able to get the DLC without mods. On the Xbox side of things, it seems the base game can no longer be bought, however all the main DLC packs are roughly $30. So, you're basically paying $10 for the game itself, plus all the DLC for free, plus a brand new (and hopefully active) online playerbase who never experienced the original title. PC players will also finally be able to get their hands on Big Surf Island and any DLC they missed before Origin if they don't want to mod their game. The Up-res is a bonus for those who have a 4K TV. All-in-all, I personally think it's worth it and will definitely be picking it up, but at the same time I can see why some people question its worth, considering it is literally the exact same game from 10 years ago. ykiki and FT-1 like this. I hope that if this does well, EA maybe, just maybe, possibly consider bringing the series Burnout. Maybe this is a start for a U-turn for EA to get back on to the throne it once held, when EA games were masterpieces. sirjim73, SZRT Ice, VXR and 2 others like this. This is one of the main reasons I'm in favour of having Paradise remastered. 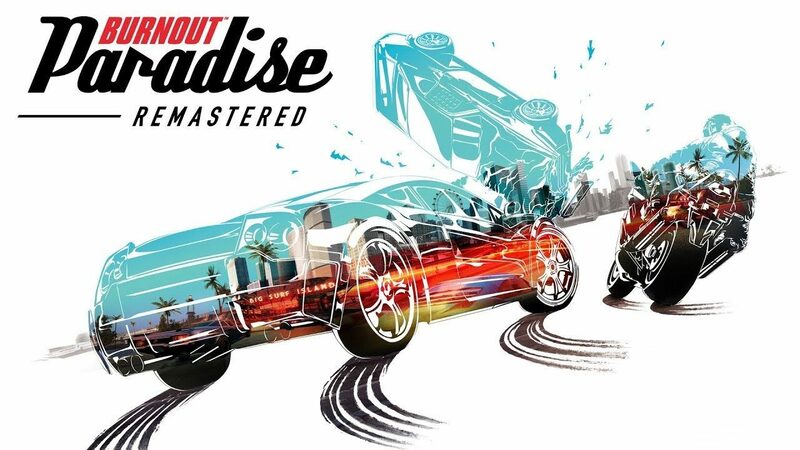 Perhaps EA are testing the waters by giving Burnout Paradise a slight makeover. If this does well, work can begin on remastering either Burnout Takedown or Revenge (or in an ideal world, both!) or even work on a completely new Burnout game. I'm really curious to know what other projects the Stellar Entertainment studios are working on, especially as the CEO of the firm was in charge of Criterion Games and Three Fields Entertainment (the team behind Danger Zone). Apollo440, SZRT Ice and Doomotron like this. I wouldn't mind a burnout revenge re release (or backwards compatible on xbox) has my favourite soundtrack of any EA trax game , either that or SSX3 was best soundtrack for me. I'm excited about picking this up, haven't played it in years and sold off all my old consoles/games..... looking forward to letting my kids unleash on it too. Just minutes till the download finishes up on my PS4, can't wait to re-live my 2009. Apollo440 and SZRT Ice like this. A GT6, GT4, and GT2 remaster needs to happen. Or just do a GT Collection. MOPARbarrett5, PocketZeven and FT-1 like this. If Polyphony Digital do a remake/remaster, they should follow one rule: pick an instalment with an even number. I'll probably bite when it's £20 for ps4 but kicked the arse out this game years ago on Ps3. It's essentially a cash grab from a company who'd said they never do remasters eating humble pie because they made an arse of the NFS license & before there's any other good arcade racers out like Onrush. Asking £30 - £40 is typical EA greed.